MusicSafe Classic natural sound ear plugs from Alpine Hearing Protection offer the same great features as the MusicSafe Pro, except that the Classic version has two sets of interchangeable acoustic filters instead of three. The set of filters that is omitted in the Classic are the white filters, which offer the lowest attenuation. For professional singers and those using their MusicSafe ear plugs in environments where you need just a little attenuation to take the edge off the noise you hear, we recommend the MusicSafe Pro. For most applications, however, the MusicSafe Classic gives you just what you need: a choice of two levels of hearing protection. Silver filters provide NRR 11 hearing protection, while gold filters provide NRR 16. 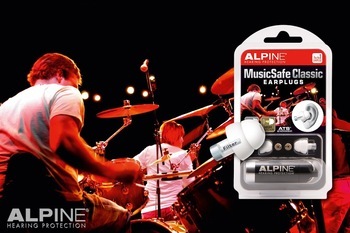 For a value-priced alternative to MusicSafe Pro, and MusicSafe Classic we recommend Alpine PartyPlug ear plugs. PartyPlugs are fitted with a single set of filters that are not interchangeable. These filters are equivalent to the Silver filters provided with MusicSafe Pro and Classic, and are appropriate for many common applications. Alpine MusicSafe Classic Natural Sound Musicians Ear Plugs (NRR 11/16)5KarenAugust 11, 2016I got to music concerts on a regular basis. They last anywhere from 3 to 12 hours. These earplugs are my "go to" to ensure I don't have ringing in my ears after the show. I can still hear all the highs and lows, talk to people, but I don't have the ringing in my ears when it is done. I owned these for many years before I bought custom earplugs. I lost my custom earplugs and had to have them replaced, and bought some more of these to tide me over till my custom ones came. Please note that I'm a woman and I have fairly small ear canals and these fit perfectly and don't hurt my ear canals. Alpine MusicSafe Classic Natural Sound Musicians Ear Plugs (NRR 11/16)5LukeJuly 15, 2013I ordered both these and the EarPeace High Fidelity Hearing Protection Ear Plugs. Both plugs are virtually identical: they are both low-profile, flexible, two-flange plugs that stay comfortable over extended listening periods (as opposed to the Etymotics, which I can't stand to wear for more than 30 minutes at a time). The MusicSafes cost twice as much, presumably because they come with interchangeable filters, but I could discern no difference between the Gold & Silver filters. Without this benefit, the EarPeace are a way better value. Same comfortable plug with a much better (metal instead of plastic) carry case, AND a 3rd extra plug FOR FREE in case you lose one. One caveat: both types mentioned may be too small for larger canals. I have to play around with them and get them in at just the right angle to make the two flanges completely seal on my canals. I think the flanges should be a little bigger, since there's only two. People with smaller canals can trim them down with cuticle scissors, but if they are too small right out of the box, there's nothing you can do. They seal my canals, but just barely! Alpine MusicSafe Classic Natural Sound Musicians Ear Plugs (NRR 11/16)5PaulBJune 24, 2013Great ear plugs. A little difficult to insert and remove for me, but the sound is amazing. I can hear cymbals and hi-hats with no ringing in my ears after performances! This was a great find! Alpine MusicSafe Classic Natural Sound Musicians Ear Plugs (NRR 11/16)5RobFebruary 24, 2013Plugs worked as expected. Enjoyed 3 hours of live music without the "ringing" afterwards. Alpine MusicSafe Classic Natural Sound Musicians Ear Plugs (NRR 11/16)5Paulo LiraSeptember 6, 2012Just the best earplugs ever! You won't be disappointed!!!!!!! Alpine MusicSafe Classic Natural Sound Musicians Ear Plugs (NRR 11/16)5KevinAugust 14, 2012These work well. They allow a better range of sound 'through' when listening to music as in concerts or band performances. Comfortable, and can be trimmed back to be almost invisible if that is an issue. Alpine MusicSafe Classic Natural Sound Musicians Ear Plugs (NRR 11/16)5Richard SJuly 18, 2012These earplugs are comfortable and fit very snugly in my ear canals. I put them to the ultimate test -- a Dinosaur Jr show in a 150-capacity room, standing about 15 feet in front of J Mascis's wall-o-Marshalls. The show sounded mostly clear, if a bit muffled, with the gold filters in, and -- incredibly -- I had ZERO ringing in my ears afterwards. The plugs block a lot of room sound, which makes it tough to converse with them in, but once the music started I could pick up a lot of detail in the band's sound. If you're looking for serious hearing protection for LOUD music but not wanting to sacrifice the audio quality of the concert experience, these plugs are a good bet. For quieter shows, however, I suspect the level of sound reduction these plugs provide might be a bit too much. Alpine MusicSafe Classic Natural Sound Musicians Ear Plugs (NRR 11/16)5Greg LMay 23, 2012They seem to do the job (I test fit them but haven't really tried them in a concert setting yet). I expected to hear 'more sound,' but they seem to allow enough through that I can hear what's going on around me. They seem to go in easily and offer a good snug fit. My one complaint would be that swapping the cyclinders out (this model comes with a silver and gold insert) is not as easy as it could be and the instructions are kinda poorly written). It showed using a pair of scissors to hold the insert during removal, but I wound up causing a small tear trying to swap mine out-darn!. Otherwise, these do a very good job and I'd buy them again. Alpine MusicSafe Classic Natural Sound Musicians Ear Plugs (NRR 11/16)5MerilynJanuary 30, 2012I had all but given up on my favorite dance classes since they turn up the dB to insane heights. Went to one of the louder classes today and voila—I couldn't tell that the music was too loud. Plugs are fairly comfortable and my ears are not ringing. Alpine MusicSafe Classic Natural Sound Musicians Ear Plugs (NRR 11/16)4Evan cMay 30, 2011Excellent set of plugs. Not perfect but best option short of paying $200 for molded plugs. A little too soft for me, but they do seal well. Filters good but I don't really like the case that well the Etymotic plugs cases are much easier to work with. Alpine MusicSafe Classic Natural Sound Musicians Ear Plugs (NRR 11/16)5glenn JApril 5, 2011Nice and comfortable - I use them for music and also on my motorbike. Alpine MusicSafe Classic Natural Sound Musicians Ear Plugs (NRR 11/16)5Gordon R.February 10, 2011Very comfortable, my guitar sounds clear as a bell! The gold filter worked best for me. The highs and mids were decent, lows a little muddy. Would buy another pair! Alpine MusicSafe Classic Natural Sound Musicians Ear Plugs (NRR 11/16)4Grant BFebruary 7, 2011These plugs do a good job of staying out of view, and allowing me to hear what I need to. I mix FOH for a large church and they want us to run at volumes that wear my ears out after a full morning. These allow me to mix where I need to without ringing afterward. The only thing I've noticed is that they tend to allow a slight bump in the low mids, so if I'm not careful I'll mix a little thin with them in. For regular purpose listening, or playing/going to shows, they are fantastic. Alpine MusicSafe Classic Natural Sound Musicians Ear Plugs (NRR 11/16)5LizJanuary 16, 2011They are wonderful. Soft. Great fit. Cuts the volume to a comfortable level.